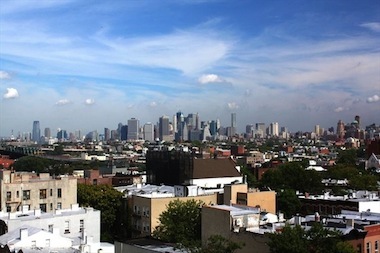 Manhattan skyline view from a Park Slope roofdeck. MANHATTAN — Though the holiday season is often the best time to find a deal in the rental market, this year there are even more bargains out there as inventory continues to rise. Renters aren't necessarily biting though, experts say. Concessions — such as giving a free month’s rent or paying the broker’s fees — are at record high numbers in Manhattan and Brooklyn, according to Douglas Elliman’s analysis of November deals. More than 25 percent of Manhattan transactions had some sort of concession from the landlord to sweeten the pot, according to the report released Thursday. That record was up from 13.5 percent a year ago. Brooklyn’s share of rentals with incentives from owners also hit a record. More than 15 percent of deals had some sort of carrot to lure renters, which was more than double the 6.6 percent of such transactions last year. Though the number of rentals with concessions spiked, the actual size of the concessions barely budged. In Manhattan, the incentive averaged about 1.2 months of free rent, and in Brooklyn, it was about 1.6 months. “The market share for concessions is broader, but the amount itself being offered doesn’t seem to be expanding," said Jonathan Miller, the real estate expert who authored the report. "At this point, in order to keep buildings full, landlords see they have to offer concessions," Miller said. By offering concessions, landlords can keep their asking prices high. Manhattan’s median rent was essentially flat at $3,350 a month. Its listing inventory rose nearly 25 percent to more than 7,200. Meanwhile, Brooklyn’s median rent slipped 1.3 percent to $2,780 a month. Its listing inventory rose 29 percent to 2,606. The concessions aren’t necessarily helping landlords too much, according to a Citi Habitats report, which found that Manhattan’s vacancy rate hovered above 2 percent. That was the highest rate in 7 years, according to its data. Also, because concessions typically only effect the initial lease rather than a lease renewal, they’re sometimes not enough to lure skeptical renters, Malin noted. In the smaller market of Northwest Queens, which includes Astoria and Long Island City and is the only region of the borough the Elliman report covers, the median rent was $2,555 a month, down from 6.6 percent a year ago. Listing inventory was up there, too, more than 46 percent to 616.